Home Trends Dinnerware comes in cute patterns that are excellent for everyday dinnerware. 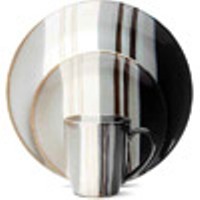 If you are interested in discovering comparatively cheap dinnerware sets with style, this might be your brand. The Home Trends casual dinnerware sets are private label items made for Wal-Mart by Gibson Overseas Inc. Of course you can buy these unique patterns at any Wal-Mart store or through their online store. You can find replacement pieces of discontinued patterns at replacement companies, at garage sales, in second-hand stores, or through online auctions. I have heard some talk about recalls of dinnerware from Home Trends, so I looked it up. It is true; in 2004 the 16-piece dinnerware sets of the Home Trends West Palm pattern were recalled along with the West Palm Open Stock 16 ounce mugs. They were found to contain excessive levels of internal leachable lead. The recall is ongoing, so I would beware of purchasing that particular pattern. This dinnerware is manufactured by a reputable company, so I wouldn't consider one strike a bad apple that spoils the bushel. 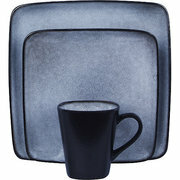 The Home Trends brand of dinnerware is very attractive and modern. It is fairly inexpensive and pretty durable. Most patterns are microwave and dishwasher safe, so they are perfect for dishes used everyday by a family. The designs can easily be fit into your kitchen décor. The square dinnerware sets add a twist to the desire for a decorative table setting.